Cauvery Bridge [Ramaswami's] at Seringapatam [sic, for Sivasamudram]. bl.uk > Online Gallery Home	> Online exhibitions	> Asia, Pacific and Africa Collections	> Cauvery Bridge [Ramaswami's] at Seringapatam [sic, for Sivasamudram]. 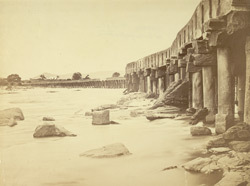 Photograph of the Ramaswami's Bridge in Shrirangapattna, Karnataka, part of the 'Crofton Collection: Topographical and architectural views in India', taken by an unknown photographer in the 1870s. Shrirangapattna, a small town near Mysore, is an island fortress surrounded by the Kaveri River that was ruled by Tipu Sultan from 1782 to his death in 1799. He was nicknamed The Tiger of Mysore for his resistance to the British. This photograph is of the Ramaswami Bridge that connects Shrirangapattna to the main land. The Kaveri River arises in the Western Ghats and flows west to east through Karnataka and Tamil Nadu to the Bay of Bengal, South India. It splits in two twice and forms the islands of Srirangapatnam and Sivasamudram in Karnataka.